I bought a charm pack of Moda fabrics, ('Fall back in time'). I just love them! Anyway, I've started on what I'm hoping will be a table runner. I was going to do a cathedral window quilt with these fabrics, but I just couldn't find a solid I liked to go with them all. So instead, we have this: This part is about 3/4 done. Then I plan on doing a thin strip of cream around this section, then a thicker strip of brown, hopefully corduroy around that. I can't decide how to quilt it. I'll probably just stitch along the seams. I thought about putting buttons in some of the squares, but I'll have to see what I think about that. I'll probably back it and bind it with solid brown. 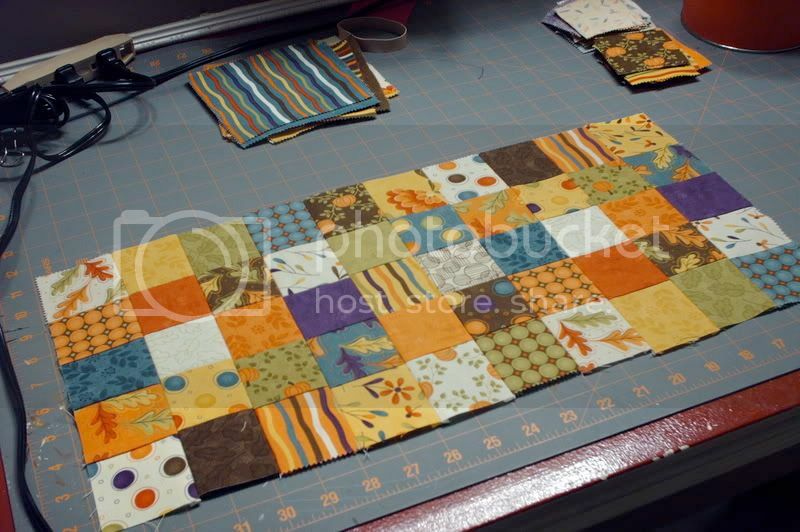 Any ideas for the quilting? It might be fun to try something new ... without destroying it, of course. It's a gift and I want it to be really cute. Oh, and I would like to finish it when it's still fall!